Macks Papo whose birth name and real name is Macks Senatla sa ga Papo is a South African Actor, Playwright and Poet who is best known for the role he played as Marothi Maphuthuma in SABC1 soapie drama Skeem Saam and Boipelo in Mzansi Magic’s telenovela The Throne. He was born in Mamelodi, Pretoria, South Africa. Macks Senatla sa ga Papo was born on the 06 December 1965 in Mamelodi near Pretoria, Gauteng. He showed an interest in drama, poetry and music at school. He won an American Field Service scholarship to Columbus North High School in Indiana, USA, where he graduated with distinction in 1985. He was born on the 6th of December 1965. He is 53 years old as of 2018. Macks Papo enrolled with the Wits Drama School in 1988. He graduated in 1992 with a BA Dramatic Arts degree. Highlights of his career are Pick of the Fringe Award-winning plays like No Good Friday, Survival, Bear in Zermatt, Switzerland and Kwamanzi at the Balmoral Castle in Scotland for the entire British Royal Family in 1992; playing Moleka in Bessie Head’s Maru for PACT at the Windybrow Theatre, from 1993 to 1995. 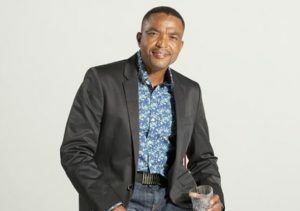 Macks played the role as Tsheko Mashabela in the M-Net soapie Egoli, from 2000-2007 and also stars as wealthy businessman Ivan Tshinawa on the e.tv soapie Rhythm City, since 2007. He currently plays the role of Marothi Maphuma in SABC1’s Skeem Saam and as Boipelo in Mzansi Magic’s The Throne.